Balkan Urban Movement had a unique opportunity to take part in the opening of the exhibition entitled Epic by the artist Nikola Kolya Božović with whom BUM has a years-long cooperation. Since 2003 BUM has promoted the importance of arts and culture among young people with help of Kolya. Kolja Božović attracted the attention of visitors using wigs, costumes and makeup to create a series of movements, as well as a disturbingly vulnerable and ambivalent character who likes to like, and epic paraphrases served him as a decorative fiction and performance, exploring contemporary obsessions with heroism, mythology and popularity, explained the curator Aleksandra Lazar at the opening of the exhibition of this artist. The exhibition of one of the most prominent visual artists of the middle generation in Serbia, Nikola Kolya Bozovic, opened on 14th September at the residence of the Ambassador of Switzerland in Belgrade. I wonder what kind of a man he used to be, what kind of a man he would be today. 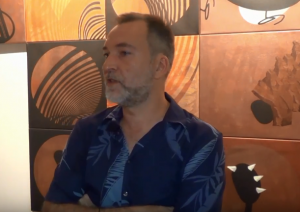 The works in this exhibition have been inspired by these thoughts and I hope that they connect to my previous work, but also come freely from my subconsciousness… – said artist Kolya Bozovic. The exhibition of paintings, sculptures and installations called Epic presents Božović’s visual paraphrases of epic poems from the cycle about Marko Kraljević. As soon as I arrived in Belgrade two years ago, I was immediately impressed by the vitality of Belgrade’s cultural life. It is no coincidence that Belgrade has seen the birth of talents such as Petar Lubarda or Marina Abramovic. I do consider that Nikola Kolya Bozovic belong to those contemporary artists living and working in Belgrade who carry on the legacy of cultural creativity specific to South East Europe – said Ambassador of Switzerland of Serbia Philippe Guex. The exhibition will be open to the public from October 19 to November 1 twice a week on Wednesdays from 5pm to 7pm and on Saturdays from 4pm and 6pm.